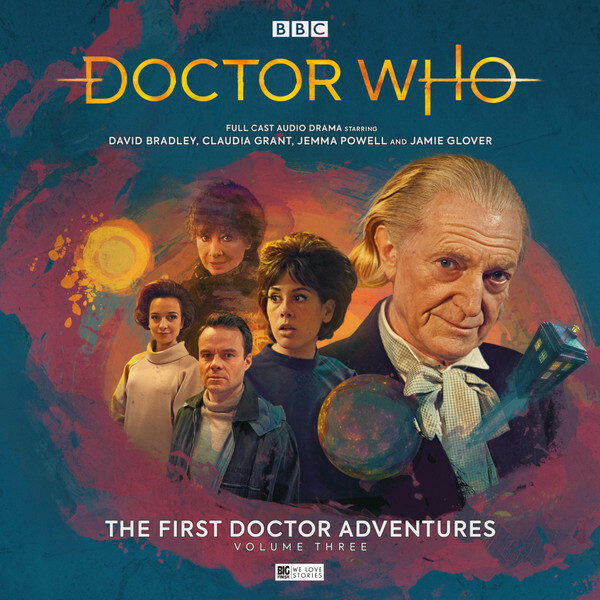 David Bradley again takes up the reigns of the First Doctor with the new version of the first Tardis crew with Claudia Grant (Susan), Jemma Powell (Barbara Wright) & Jamie Glover (Ian Chesterton) in two even newer stories. In The Phoenicians by Marc Platt the Doctor and co find their ship has landed in Tyre when the King who reigns the Phoenicians and his sister have had a deathly falling out that disrupts their whole civilisation. The Doctor gets separated from the rest of the Tardis crew and must use his cunning to survive when he falls out of favour of King Pygmalion (Jo Ben Ayed) Meanwhile Ian fights not to become part of the counsel of Princess Elissa (Ajjaz Awad) and must simultaneously help Barbara and Susan keep their freedom. All this and they need to not fall foul of history and legend. This is an interesting script from Platt full of a part of history I previously knew nothing about. Certainly one to interest anyone who is a real history buff. I must admit as somewhat of a philistine when it comes to a deep dive into history this felt in places a bit dense with the historical context for my tastes. The story itself is great and the characters are well rounded given that it sounds from the extras that these are people who for us live between myth and history. Something that gives Platt a rich area to expand upon and pick parts of the uncertain history to shape how best fits the story and gives a very satisfying ending. This story also fulfils something I appreciate, in that is doesn’t take credit for part of history we know and give it to the Tardis crew. The people who achieved in history good or bad keep their achievements, the Tardis crew do some other things that go around established history. The guest cast is good and this does feel like a show from the original series early days; just with perhaps a better theoretical budget than they might have been able to realise on-screen. We then go to the futuristic tale for this set with Tick-Tock World by Guy Adams. The Tardis tries to navigate some choppy waters in the Vortex; landing it’s inhabitants on a strange world where time seems to operate differently and separating them from the ship. The Doctor finds himself not dead, but not as alive as he might hope and Susan finds a strange woman calling to her; one that to the listener might sound familiar. This is the type of story I am very much personally drawn to. They have drawn the characters from the classic first few series of Doctor Who just as they were back then and landed them against a high concept situation and guest characters who I don’t think they would have dreamt of in the 60’s. It’s wonderfully weird and the Tardis crew are all personally tested, the Doctor included. It’s a very strong adventure for Susan and how wonderful when we come up against her future version in Carole Ann Ford (the original you might say…); which by the way isn’t a spoiler (she’s on the cover and is revealed early on). It’s very clever how you feel the character development through the original Susan, thusly you don’t feel like they are pushing this element in the younger Susan as character development in the original series was more slight than in modern day stories. The Doctor does get challenged in his views somewhat, but it doesn’t feel too much to take his character out of who we know the first Doctor to be. It’s both modern and old fashioned all at once.